Allows adding content assertions for all the responses to all the requests in a User Path or Container. This answers the problem of needing common application validation rules for a number of requests within a same parent node. To decide whether or not a response to a played request should be validated, NeoLoad retrieves the Content-Type header in the server response and checks if the header value appears in the list of types checked. By default, only responses with a text/html or text/xhtml Content-Type are checked. To edit the list of types to be checked, follow the Set application rules link. For more information, see Global validation. If the response type is listed, NeoLoad makes sure that the response content matches the various assertions. Information: Global validation is not applied to failed requests (HTTP error, network error...), nor to requests with responses in cache (304 HTTP status code). Warning: Using global validation uses a lot of memory so it is therefore recommended to use it sparingly and avoid applying it to large responses. 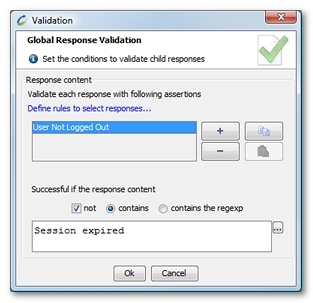 Global validation checks to see if a response contains, or does not contain, a certain content. The response is deemed valid if all the content conditions have been fulfilled. contains: checks to see if the response body contains the specified text (for example <span class="welcome">Welcome</span>). contains the regular expression: check to see if the response body matches the specified regular expression (for example <span class="welcome">Welcome \w+ \w+ </span>). Note that the content assertion may use NeoLoad variables.